We are always close to nature in Iceland and great trails in unspoiled wilderness are never far away. 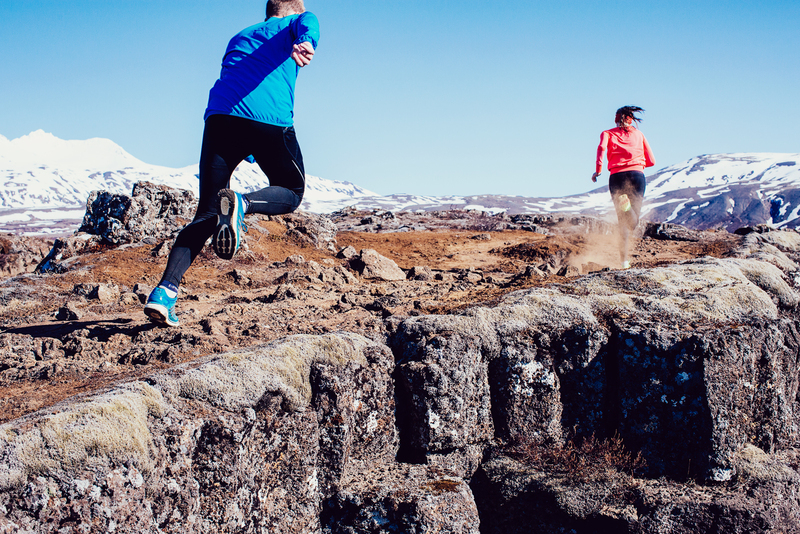 One of the most exciting trail races in Iceland is the Peaks Run in Mosfellsbær, a town minutes away from Reykjavik. Mosfellsbær is a really lovely town with two great swimming pools. The town perfectly combines the advantages of urban and rural areas, the convenience of the city with the surrounding environments of vast wilderness and untouched nature. Mosfellsbær is surrounded by mountains, including two of the most popular mountains for outdoor recreation in the country, Mt. Esja and Úlfarsfell. The race is a co-operation between the town of Mosfellsbær and Kyndill rescue squad, who are part of the volunteer rescue teams so important to the Icelandic community. In recent years trails have been marked through valleys and up hills and mountains near the town, many of which are used in this race. The lower mountains in Mosfellsbær are also perfect for walking with children or for those getting started in hiking or trail running. Helgafell is 216m high, Mosfell 276m and Úlfarsfell 296m, although the total elevation gain is much less, around 120-180m. Grímmannsfell is the highest of the 7 peaks, 484m high. The trails in this race vary a lot. The course uses some of the most popular hiking trails in the country, like the one up Úlfarsfell, but there are parts in between where it goes straight across fields or down hills on no particular path. However, excellent course markings always show the way. The first and last part of race in Mosfellsbær town are run on asphalt. Here are last years results, just to give an idea of how long it will take to run the various distances. The race ends at the sports center in Varmá (“warm river”). There is a swimming pool there and another newer one, Lagafellslaug, is also close by. As always in Iceland, a stop in the swimming pool after the race is a must ! Another treat in Mosfellsbær is the bakery Hafliði Konditori, a favorite for those hiking the mountains around the town. Mosfellsbær is also famous for being the hometown of Halldor Laxness, Iceland’s Nobel winning author. His home was in Gljúfrasteinn, close to many of those peaks in the race. It is now a museum well worth visiting. Here is the race Facebook page. Registration for Icelandic runners is here.